A copy of Pokémon: Let’s Go, Pikachu! or Pokémon: Let’s Go, Eevee! Step 2: Whether the Poké Ball Plus is new or brand new, make sure it is charged. Step 3: Fire up your copy of Pokémon: Let’s Go and progress far enough into the game that you can left Pallet Town and delivered a parcel to Professor Oak. Step 4: Access the pause menu and access Communication. Step 6: From the Mystery Gifts menu, be sure to click on the one that says Get with a Pokémon Ball Plus. Step 7: You will be told there is a Pokémon in your Poké Ball Plus and it is a present for you. Click A to move proceedings along and say Yes to receive it. A warning prompt will pop up, which will tell you that if the battery runs out, or you are disconnected when receiving the gift, you may longer be able to receive it. It is important that both your Nintendo Switch and Pokémon Ball Plus has a good charge of them. Step 8: You will now get a message that says you will now click to the internet and asked if that is okay. Select Yes to start collecting. 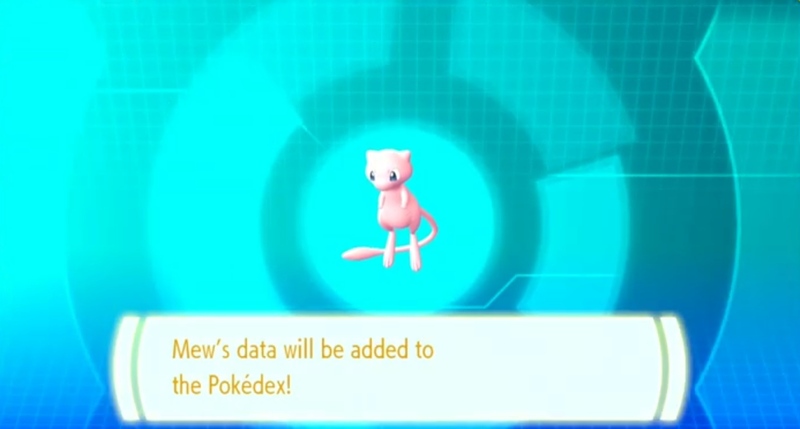 Step 9: Once connected, you will receive Mew and Mew’s data will be saved to your Pokédex. Step 10: Quit Mystery Gift and Save your game. Bonus Tip: You can now use Mew to your heart’s content. The Mew you receive is Level 1 and can be added to your team straight away. Mew can ONLY be received from the Poké Ball Plus ONCE!!! Creating a save file on another My Nintendo account on your Switch will not get you another Mew. As always, we hope you found this guide helpful and hope you check out some of the other guides we’re providing for Pokémon: Let’s Go games. Tags: Guide, Mew, Nintendo Switch, Poké Ball Plus, Pokémon Let's Go! then while I was browsing my pokedex, I noticed mew´s entry is missing, its only listed as “seen”, its sprite shaded and info with question marks..
is some one else having this issue as well? I will have to check but I do believe Mew did register on my Pokédex.